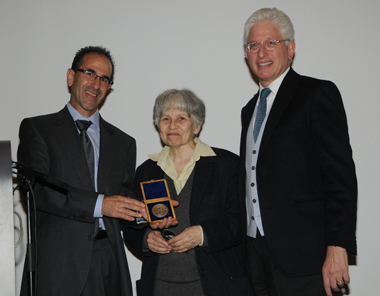 February 14, 2013 – Prof. Alla Kushnir-Stein was awarded the 2013 Ya’akov Meshorer Numismatic Prize at a ceremony and reception in her honor at The Israel Museum, Jerusalem, on January 15. Kushnir-Stein retired from her teaching as professor in Tel Aviv University in 2009, but has continued publishing, editing and supervising graduate students. She is the fourth recipient of this award, and the first Israeli and first woman to receive the coveted Meshorer Numismatic Prize, which carries a cash award of $5,000. From left: David Hendin, ANS adjunct curator; Prof. Alla Kushnir-Stein, recipient of the Meshorer Prize; Dr. Haim Gitler, curator of numismatics at the Israel Museum and president of the Israel Numismatic Society. From left: Haim Gitler, curator of numismatics at the Israel Museum and president of the Israel Numismatic Society; Prof. Alla Kushnir-Stein, recipient of the Meshorer Prize; James Snyder, director of the Israel Museum, Jerusalem. James Snyder, director of the Israel Museum made introductory remarks reminiscing about Prof. Ya’akov Meshorer and honoring Kushnir-Stein at the ceremony, which was attended by more than 200 people at The Israel Museum. 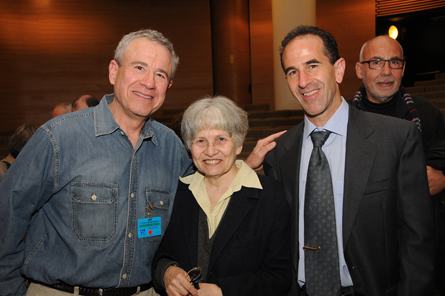 The audience included Prof. Stanley Fisher, governor of the Bank of Israel, as well as members of the Meshorer Family, including Ya’akov Meshorer’s widow, Adaya, their two sons Nitzan and Y’shai, grandchildren, and Meshorer’s identical twin brother Asher, a retired medical researcher at the Weitzman Institute, as well as prominent archaeologists and numismatists. 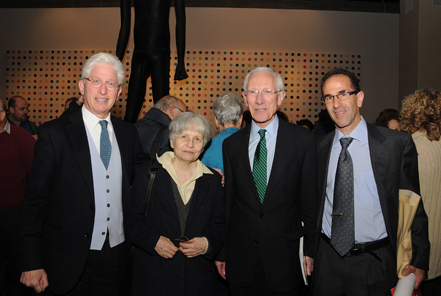 From left: James Snyder, director of the Israel Museum, Jerusalem; Prof. Alla Kushnir-Stein, recipient of the Meshorer Prize; Prof. Stanley Fischer, governor of the Bank of Israel; Dr. Haim Gitler, Curator of Numismatics, Israel Museum and president of the Israel Numismatic Society. Hendin also announced that the Honorable Abraham Sofaer and his wife Marian are in the process of donating their massive collection of ancient coins of the land of Israel to the Israel Museum and the American Numismatic Society; all of these gifts are made in memory of Ya’akov Meshorer. Ya’akov Meshorer (1935-2004) established the Numismatic Division at the Israel Museum in Jerusalem in 1969 and continued at its helm until 1993. He also served as the Museum’s Chief Curator for Archaeology from 1975 to 1982 and from 1990 to 1996. He retired from the Israel Museum in 2000. He was appointed Professor of Numismatics at the Hebrew University, Jerusalem, in 1983. His contributions were recognized by the award of prestigious prizes, among them the Yad Ben-Zvi Prize in 2001 and the Archer Huntington Medal of the American Numismatic Society in the same year. The Ya’akov Meshorer Numismatic Prize was established in Meshorer’s honor at The Israel Museum in 2001, thanks to the generous donations of numerous friends of the Israel Museum, including Abraham and Marian Sofaer, Maud and Arnold Spaer, David and Jeannie Hendin, Leo Mildenberg and Jeanette and Jonathan Rosen, a numismatic prize was established in Yankele’s honor (the original sum that was raised for the prize was $50,000 but later the sum of the fund was doubled and today exceeds $100,000). The first recipient of the Meshorer Numismatic Prize, in 2002, was Dr. Andrew Burnett, who was at the time Keeper of the Coins and Medals Department at the British Museum and President of the International Numismatic Council. In 2006 the Museum granted the prize to Dr. Michel Amandry, Director of the Cabinet des Médailles, Bibliothèque Nationale de France, and the successor of Dr. Burnett as President of the International Numismatic Council. The third recipient was Prof. Michael Metcalf, in 2008, who was the Keeper of the Heberden Coin Room in the Ashmolean Museum in Oxford. These three scholars are amongst the most renowned numismatists today. You can find a list of puliblications of prof. Kushnir-Stein here. And this is the website of the Israel Numismatic Society.